I strongly recommend those in Japan on June 1, 2 to come and attend the Heian Jingu Takigi Noh fire-lit performances in Kyoto. 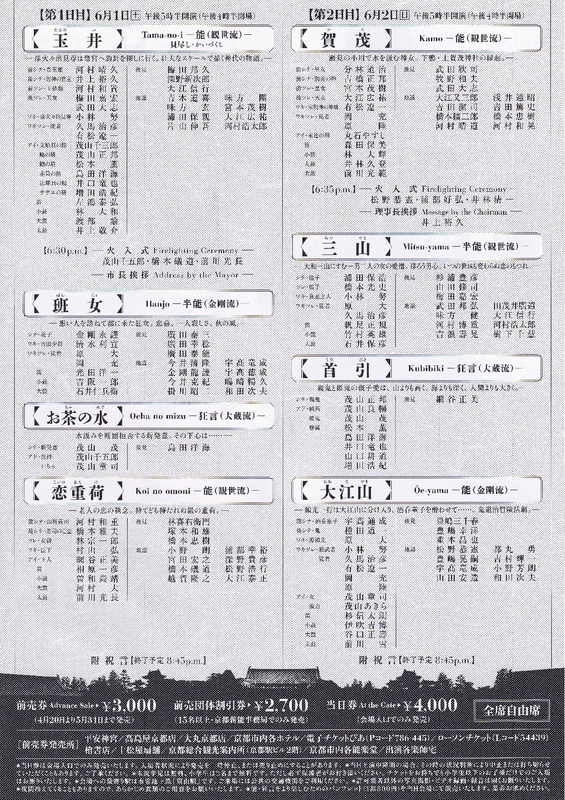 It is a unique chance to see full performances both by Kanze and Kongo master-actors, in the context of the evocative Heian-jingu shinto shrine. Performances begin at 5:30 (doors open at 4:30 and I encourage you to come before this time – seating is on a first come, first served basis) and end at around 8:45. Tickets are between 4,000 and 2,700 yen depending on the type. 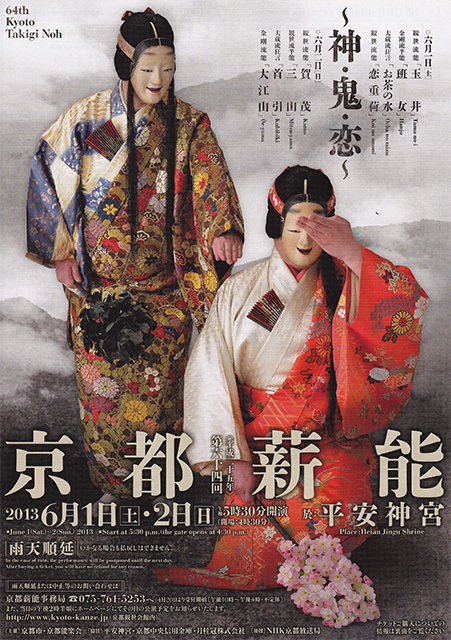 The INI International Noh Institute will have a stand with free information, translation and synopses in English – I will be there in person! ^_^ Do not hesitate to contact me if you are planning to come! See below for more info. —- UPDATE : advance tickets are now sold out! Yorimitsu and his companions, disguising themselves as yamabushi priests, set off at the command of the Emperor to find and kill a demon known as Shuten-doji. Guided to his dwelling on Oe-yama by a woman who has been captured and made to work for him, they beg a night’s lodging there. Shuten-doji is alarmed that his hiding-place is has been discovered, but because of a promise he has made never to lift his hand against priests, he feels bound to receive them hospitably. They drink together, but later that night when he has taken on his true form as a demon, he is surprised in his sleep and eventually killed by his enemies.